In this tutorial you will learn how to disassemble and replace a broken or on Dell Inspiron Q15R, M501R, Q17R, 17R Laptop Notebooks. You can also use this instruction to fit a new screen if you have noticed your screen flickering or you can see defect lines on it. The Dell Inspiron Dell Inspiron Q15R, M501R, Q17R, 17R laptop come with 15.6 inch HD WLED display monitor panel for the Dell Inspiron Q15R, M501R and 17.3 inch for the Q17R and 17R. 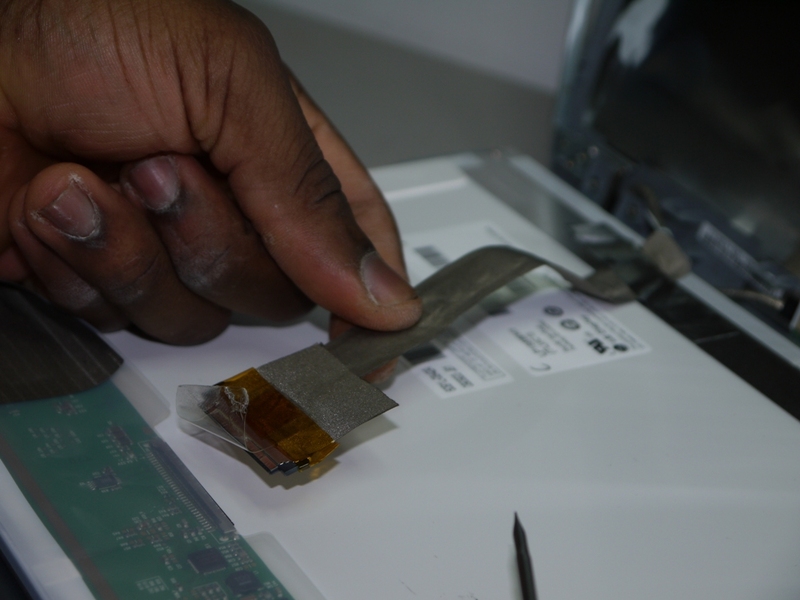 Before starting the screen replacement make sure you have the right screen to install. First and important thing is to remove the Dell laptop battery before starting the replacement. Please note that static charges could damage the backlight of the new screen if the battery is not removed before the repair. The Dell Inspiron Q15R, M501R, Q17R and 17R laptop mostly will not come with any screws in the bezel. All that is needed to remove the bezel is to put your finger between the screen and the plastic bezel and pull carefully until it released. Do this on all sides of the laptop. The bezel of the Dell Inspiron Q15R, M501R, Q17R and 17R notebook are very fragile and pulling too hard may snap it. So the best trick is to pull firmly but not too hard. In this tutorial you I will show you how to remove a broken screen of Emachines E529 Laptop Notebooks series. The above Emachines series screen display panel comes with 15.6 HD LED 16:9 Aspect ratio . Below are links to the right replacement screen for the Emachine laptop series. The one thing that is very important in this replacement is that some people will find out that their laptop looks like the one at the Acer screen replacement in our blog. 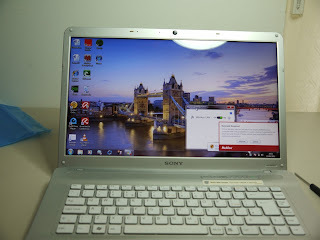 This is because some of the laptops recently branded Emachines are made by Acer. Example are Emachines E529, E442 and the E430. 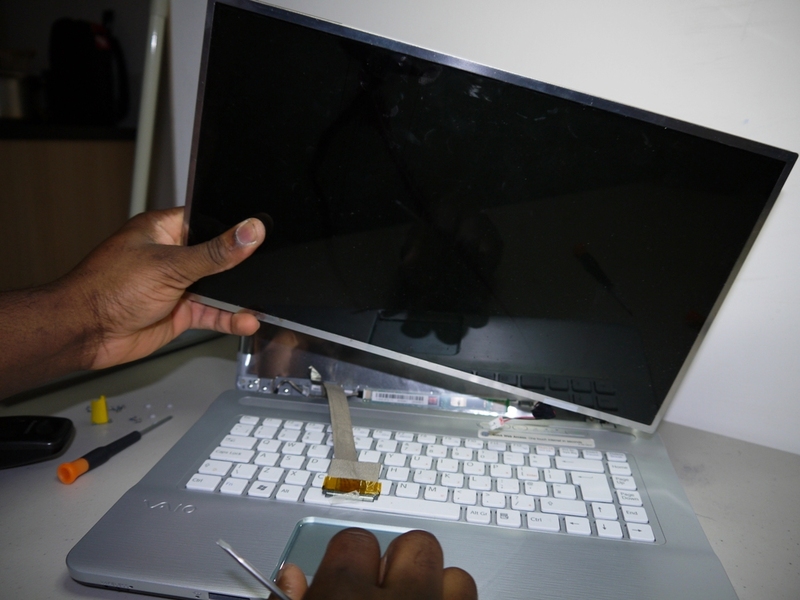 The very first thing to do is to remove the battery from the laptop before starting the screen replacement. Next is to use a flat screwdriver to remove the screw covers from the plastic bezel as in the image below. The covers are made of plastic or rubber. Under the covers you will find the screws which must be removed as well. Remove the screws from the Acer laptop after taking the cover off. This screw should be kept safely so as to not to mix it up with others. 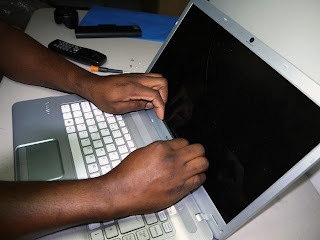 Place your fingers between the screen and the bezel as shown in the picture on the left and start pulling slightly on all the sides until the bezel is pulled free from the laptop. This needs to be done carefully as doing it wrongly or forcefully will result in snapping the bezel. The Emachines E529 bezel are very fragile and easy to snap so you must do this with care. You must not pull too hard. As the Emachines E529 series laptop comes with LED screen. Carefully pull up the clear tape holding down this screen data cable and pull the data connectors apart. This must be done with care as any mistake may cause a permanent damage to the cable or the connector. At this point you will have successfully removed the broken screen. To install a new one simply carry out the process in reverse. The LTN101NT02 LED Netbook laptop screen made by Samsung is one of the most commonly used replacement monitor in netbook brands like Dell Inspiron Mini, Acer Aspire One, Hp Mini, Compaq Mini, Toshiba, Samsung, Packard Bell Easynote, Asus Eee PC, Medion Akoya, Sony Vaio, Advent and others. Samsung LTN101NT02 as a netbook display panel is size 10.1 inch, aspect ratio of 16:9, backlight of LED meaning the screen is not inverter powered as the brightness comes from light emmitting diodes in the LCD screen. 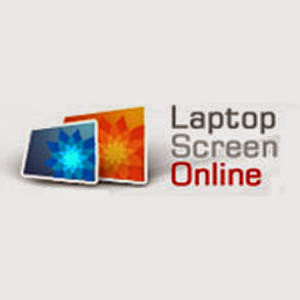 Click LTN101NT02 to order the screen. As one of the leading laptops and netbooks manufacture Dell have proved quality in their design and technology. The Dell Inspiron Mini netbook laptops are great example of this. The Dell Inspiron Mini Dell Inspiron Mini 1011, 1012, 1010, 1018, 10V, 11z netbooks are the of the best sellers among the series out there. Like every other netbooks and notebooks they the screens can crack or become defective if dropped or not well looked after. In this tutorial I will show you step-by-step how to replace that broken, flickering or blank defective LED LCD on Dell Inspiron Mini 1011, 1012, 1010, 1018, 10V, 11z Netbooks. All the Dell mini netbooks mentioned here comes with 10.1 inch widescreen display panel except for the Inspiron 1110 and 11z which has 11.6 inch slimline screenin them. 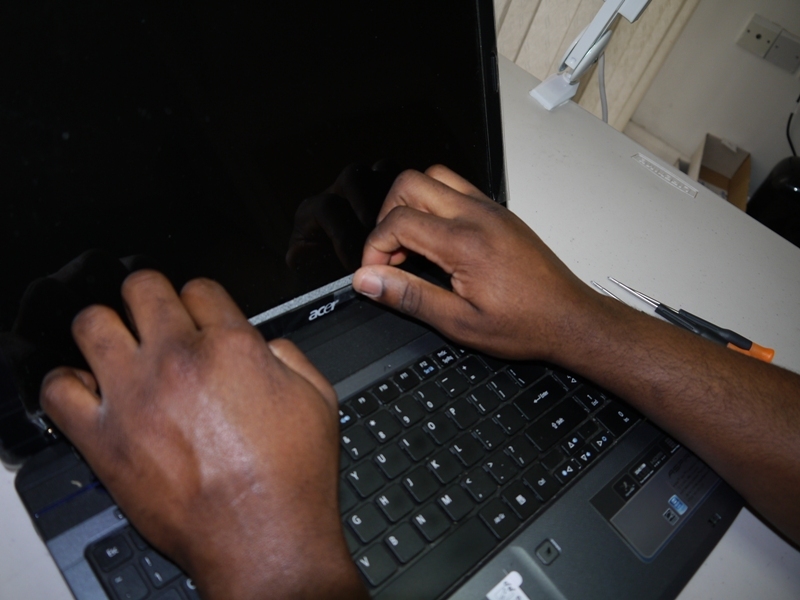 First is to make sure you have acquired the right screen before starting the screen repair. Looking at the above broken screen it is clear that the laptop may have not been dropped but may have sustained the cracked screen from the user picking the netbook up by the LCD screen. This can simply crack the screen. It is important to remove the laptop battery before starting the replacement. 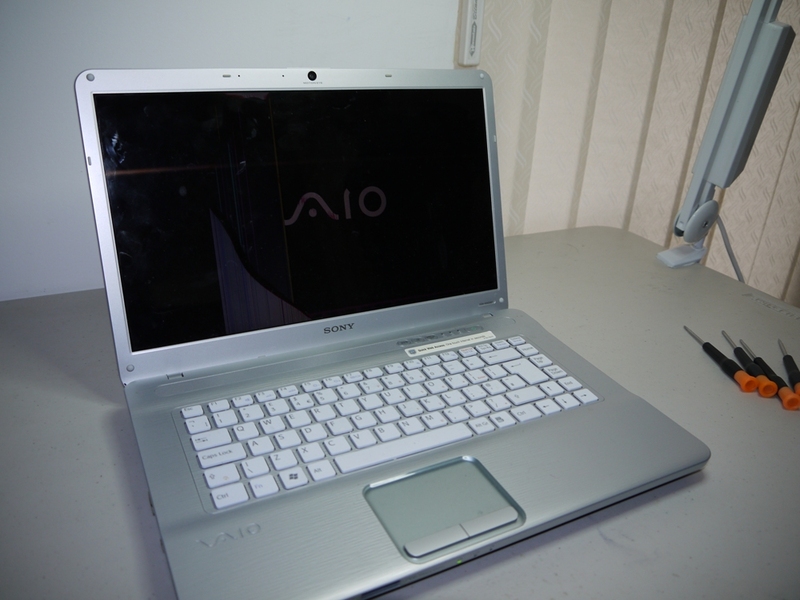 Use a flat precision screwdriver to remove the rubber-like screw covers from the from bezel. The image on the right will show you the screw to remove. Keep these screws aside as they are different from the rest. The next thing is to put your fingers between the screen and the plastic bezel and start pulling on all sides to free it from the catches. The Dell Mini screens are very thin and pulling too hard may snap the plastic. 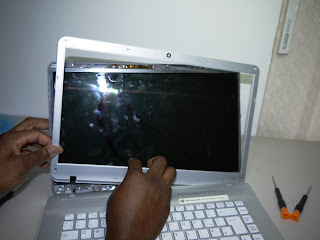 Removing the bezel will expose the screen panel inside the laptop. 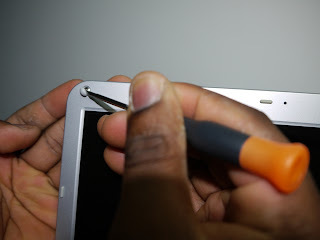 Use a Philips Precision screwdriver to remove all the screws holding the screen to the back cover and brackets. At this point if your Dell Inspiron Mini netbooks comes with a camera this is the best time to remove the cable connector as shown in the image. Pull the screen slightly towards yourself and unscrew the sidescrews. Place the screen face-down on the keyboard carefully and at this point the screen display cable, LCD part/model number and the video connection is visible. Dell do not manufacture laptop screens so the screens brands will range from LG Philips, Samsung, AUO, Chungwha, Innolux, Chi Mei and others. Remove the screen cable and at this point the screen removal process is complete. To install a new screen simply go through the process in reverse. In this blog I will show you a full video tutorial of how to replace a broken/cracked, flickering or black LCD screen on Advent Roma 1000, 1001, 2000, 2001, 3000 and 3001 laptop notebooks. This video has been expected of me for long, only that I thought I already had it in this blog. The advice is to make sure that the right screen is beside you before starting the repair. If you are not sure of the display monitor type you need for you laptop computer it is best to ask the screen seller. PLEASE NOTE THAT THE ADVENT ROMA SERIES COME WITH LED OR CCFL SCREENS. These screens are not interchangeable. Read more about LED vs CCFL. The Advent Roma Advent Roma 1000, 1001, 2000, 2001, 3000 and 3001 comes with two different backlight technology. It is best to know the type you are replacing with your defective one as they are both not compatible. For more information about this blog leave your messages and comments. 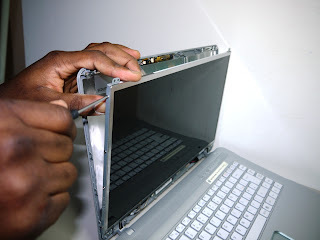 In this tutorial I will show you how to replace a broken/cracked, flickering or lined screen display on Acer Aspire 5536, 5536G, 5535, 5532 , 5736Z, 5732Z, 5542 and 5542G series notebook laptops. The Acer Aspire AS5736Z, AS5732Z, AS5542, AS5542G, AS5536, AS5536G, AS5535 and AS5532 are fitted with 15.6 HD LED LCD or (HD LCD) screen panels with aspect ratio 16:9 and resolution of 1366 x 768 pixels. 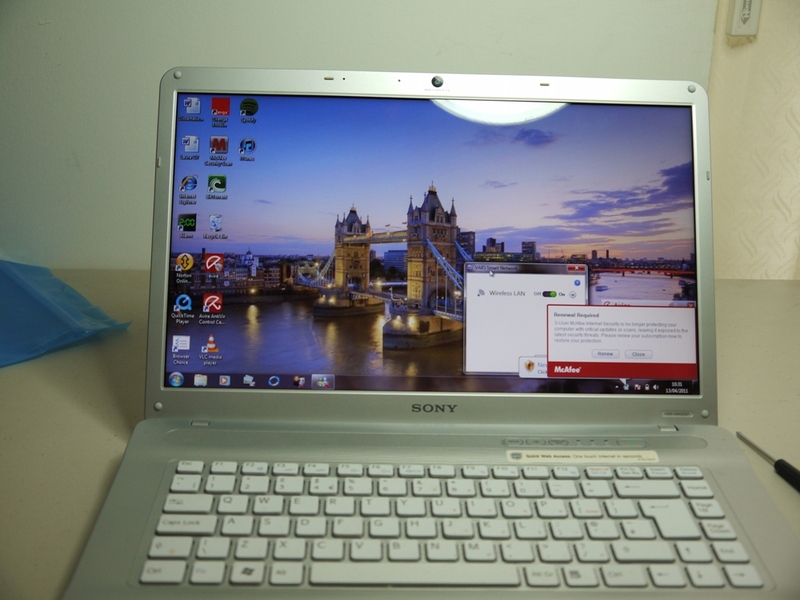 These screens have cinema clarity and termed Acer Aspire Cinecrystal (TM) screens. Before carrying out the screen replacement and repair it is advisable to make sure the right screen you need is at hand. 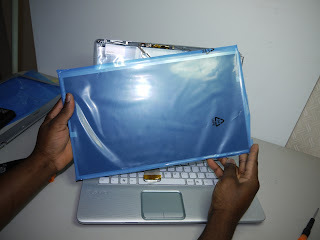 This will save having the laptop in pieces and waiting to receive your screen from the laptop screen retailer or seller. Aspire screen gone dark/blank or black - This problem can also be caused by a damaged laptop inverter. For all laptop repairs it is important to remove the laptop battery beforehand. The 5536, 5536G, 5535, 5532 , 5736Z, 5732Z, 5542 and 5542G bezel are very fragile and easy to snap so you must do this with care. You must not pull too hard. As the Acer Aspire 5536, 5536G, 5535, 5532 , 5736Z, 5732Z, 5542 and 5542G series laptop comes with LED or CCFL screen depending on the series you own. Carefully pull up the clear tape holding down this screen data cable and pull the data connectors apart. This must be done with care as any mistake may cause a permanent damage to the cable or the connector. If the screen is a the CCFL type then it will look like the one in the picture on the right. This screen will also come with the inverter wires which serves as power input to the screen backlight. READ MORE ABOUT CCFL AND LED. Carrying out these procedures will help you in successfully removing the LCD screen. To fit a new screen simply carry out the process in reverse. Leave all comments and questions in the box below.